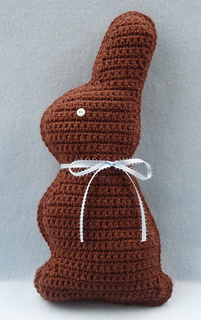 Chocolate Easter Bunny is worked flat, making front and back pieces, which are stitched together and stuffed to form bunny. Finished Size is 7” wide x 15” tall. © 2012 Doni Speigle. All rights reserved. This pattern and/or pattern photos may not be sold, or posted to any website, or electronically transmitted, or copied in any way, without the written consent of the copyright owner. You may sell finished items made from this pattern, but please give credit for the pattern to my shop www.bearsy43.etsy.com.